Growing toward God in 2019. — hannah brencher. If you’re not someone who naturally sets goals but you want to be then I have a good goal for your year ahead: find some people who value goals and then spend as much time with them as you possibly can. That’s what did it for me. Back when I lived in Connecticut, my friend Tiffany and I would gush over the beginning of a new calendar year because it was a chance to do better, grow deeper + push harder. And we loved that. We loved all parts of that. I remember this one January where she and I went to a community group for our church. We’d previously plotted all the ways we planned to kill it in the year ahead. We felt on top of the world. Our community group broke up into smaller sections and the leader brought up the focus of that group: How do you want to grow with God in the year ahead? Tiffany and I stared at one another, doe-eyed and confused. It was a look like, “How did we miss this?” We’d set all these goals— finance goals, business goals, relationship goals— and yet forgotten to set any goals with God. We’d neglected to ask him into the conversation about vision. We had plowed full steam ahead without ever thinking God might be interested in our plans. I think a lot of us get caught up in that way of thinking when a new year rolls around. We pick the lowest hanging fruit in our development. We charge into the new year wanting to be skinnier, kinder versions of ourselves. We vow to eat more kale. We start a Whole30 or go on a social media fast to wipe the slate clean. Plenty of us do set some God goals but they’re more about “doing the thing” rather than knowing God more. I’m sure some of us have been in a friendship or relationship before where we’ve felt like a scheduled box on the calendar instead of valued human being. It’s not a pretty feeling. It feels structured and stiff. It feels like you’re simply there so the other person can check you off the list. Eventually, there’s no real motivation to show up to a friendship like that. So how is God any different? How can we expect to grow deeper and more in love with him if we’re always wedging him into chronological plans and Bible apps? I propose we try something different. What if we made the space to grow deeper with God, not because it fits into a checkbox we so eagerly wanted to mark off but because we simply wanted more of him? I’m about to get very practical in the section ahead but that’s because I don’t know any other way but to propel myself into action in order to grow. The following are simply suggestions. God might have something different for you. I hope you’ll see these as starting points and ways to grow deeper in your time with God + others in the year ahead. I want to take a moment to be fully transparent on this topic and just kick the elephant out of the essay: sometimes you won’t feel like it. There are going to be places in your faith where nothing lights you up inside. There are going to be times where you cannot even will yourself to sit with the Bible. This happens. I’m telling you this because when this happens people usually make a judgment call that God is no longer present, that he’s packed his suitcase and hitchhiked down the highway and all that’s left of him in your life is a lone sock he forgot in the dryer. A spiritual drought is an opportunity for deeper springs. When you don’t know where to start, why not try the beginning? I know it might seem like I just shot down the Bible in a Year plan but I am actually pretty passionate about doing it YET for the right reasons. Pick up the chronological plan or the Bible in a year plan and then give yourself grace for the days you miss and the days you go off track. It’s not about finishing in the year. It’s about learning more about God than you did yesterday. Fair warning: there are some dicey things that happen in the Old Testament that are going to make you confused. Keep going. Stand in the confusion. Don’t close the book and give up. Just get content with not having all the answers. I swear having all the answers is not the point. This is the first year I am starting out with a prayer journal and let. me. tell. you: it’s a literal game-changer. My sweet friend Val creates a yearly prayer journal in her shop and I bought individual copies of it for my whole family this Christmas. On January 3, I opened up my prayer journal for the first time and I started to fill in the spaces. It guides you through a sweet time of writing down prayers for your family, your spouse, the world, your friends, the community you live in. I found myself texting friends and asking them what they needed prayer for. I found myself dialoguing with God. It was all the times I said “I’ll be praying for you” in a year finally having their own space to expand and become actual prayers. I ended up sitting with those first few pages for 3 hours. THREE. HOURS. This is not a drill. I know I am going to have so much to look back on in 2019 (I can already feel it) but this is definitely going to be one of the sweetest parts, tracing back through the prayers and moments of God’s faithfulness over 12 months. My girlfriends and I are getting intentional about time spent together this year. We started talking it out at the end of last year and expressing how easy it is to grow busy and disconnected when you’re always running from one thing to the next. Families get bigger. Life gets crazier. There’s never really a good time to get together. We decided it was up to each of us to clear the space and make the time. We set a date on the calendar and then made our husbands get on board. Our goal is to gather once a month to share a meal and then break off to have some intentional time together. Our first gathering was a great success. We ate Mexican tapas. We shared laughs. We grew closer through intimate conversation. We figured out how to pray for one another. God doesn’t desire for us to live a lonely and isolated life but we have to be the ones to step out and either extend the invitation or RSVP to the one we’ve been given. On the note of tracing back the moments of God’s faithfulness, a great way to grow deeper in your relationship is to make physical time to remember what God has done. If you’re stuck on feeling grateful or you easily forget what God has done in the past (aka all of us), then set up some time in your calendar to go back and retrace what God has done. Set a timer for 20 minutes. It doesn’t have to be long. Pull out the old journals and just remember. Remember when he showed up. Remember how he made the thing happen. Refresh yourself on all the ways he’s big and good and knows what you’re going through. This is why I keep all my journals, so I can go back and remind myself that he has never abandoned me and that I need him more today than yesterday. The Bible can be intimidating. I get that. There was a long time in my faith where I didn’t want to read the Bible because it all felt outdated to me. I questioned if the text was relevant to my life. This is why I cannot stress enough the investment in a study bible (this one is my favorite). The study bible isn’t going to be the bible you trek around town with. I’d recommend leaving it at home and making it your consistent study tool for your time with God. In the study Bible, you’ll get the chance to read the author’s commentary on the events happening. This commentary will help you understand some of the strange and confusing things happening. We have to remember when reading the Bible that it was written thousands of years ago. The truth in it still matters but the cultural context is something we have to take into consideration as we read. A study Bible roots you in the words but also takes time to step back and give you the history, the facts, and the significance of what you’re reading. Mercy Like Morning: My friend Jane is a literal wizard when it comes to studying the Bible and teaching others to do the same. This book will open your eyes to what true devotion to the word of God looks like and how you can forge your own path through study. 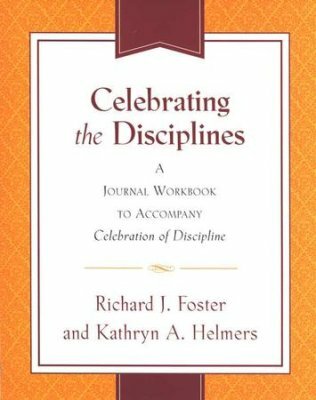 The Celebration of Discipline: Want to know more about the spiritual disciplines? This book will introduce you to all the inner + outer disciplines that you might not have even known were disciplines. 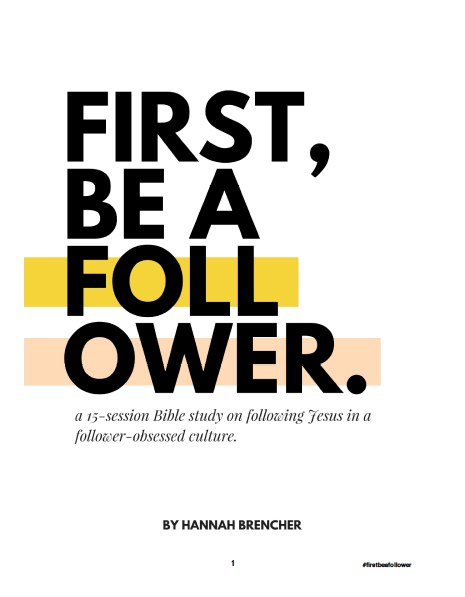 First Be a Follower: I wrote this free Bible study for anyone who wanted to a closer look at what relationship with Jesus looks like in a follower-obsessed culture. Matthew Henry Commentary: This is the commentary I reference on a continual basis. I got it on sale for 10 dollars at my local bookstore. There are so many commentaries available out there and plenty that are free on a screen (thanks to the Internet). What are some of the goals you’ve set with God this year?